This is the story that will just not go away, the Confederate Flag. And I thought that it was not effecting sports……well I was wrong. I did not know this rule or mandate even existed. Therefore, I say, who does the NCAA think they are? I thought this was a free country! They oppose this symbol of racism? I did not know the Confederate Flag was a symbol of racism. Who decided that it was racest? 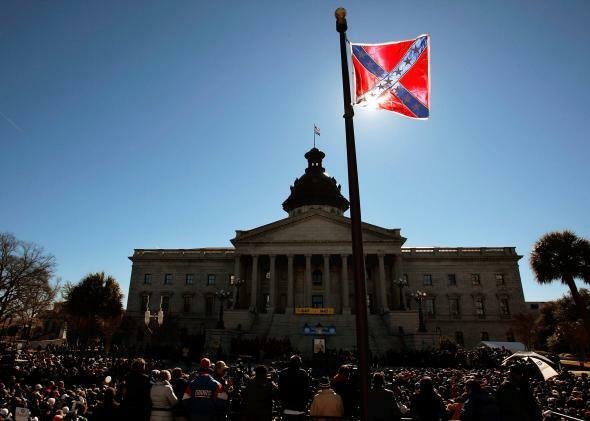 Plus, why should arenas and fields and Universities and Colleges not be able to host a sporting event because a flag is flying on the courthouse in Columbia South Carolina? The ACC has not held its baseball tournament in South Carolina since 2001 and has rotated the tournament between Durham and Greensboro since 2009. South Carolina last hosted first and second rounds of March Madness in 2002, when Duke and Alabama were the top seeds. So these and other destinations in South Carolina have lost millions of dollars because the NCAA thinks the Confederate Flag is a symbol of racism. And further more, it is not like South Carolina can start collecting some of those lost dollars immediately. 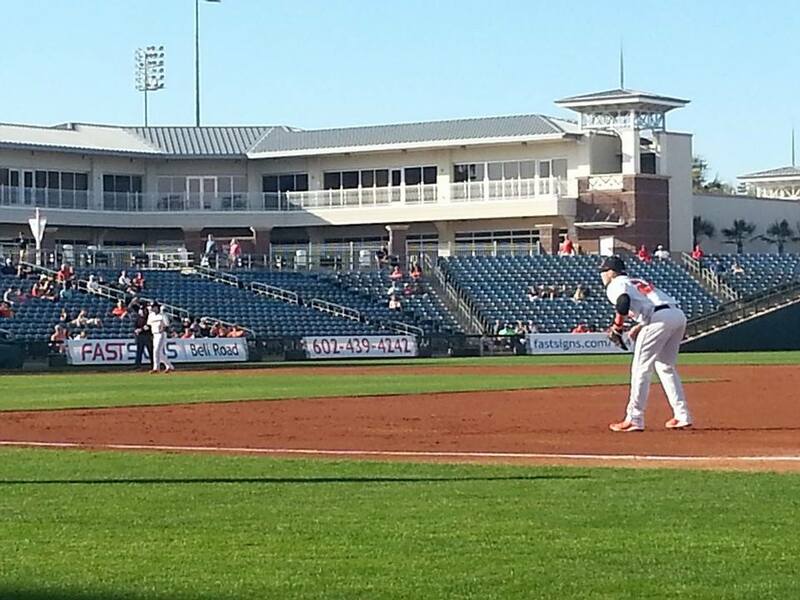 The ACC Baseball Tournament already has a contract that lasts until the spring of 2018. The same is true for the ACC Men’s Basketball Tournament as they have scheduled host sites that do not include South Carolina through 2020. 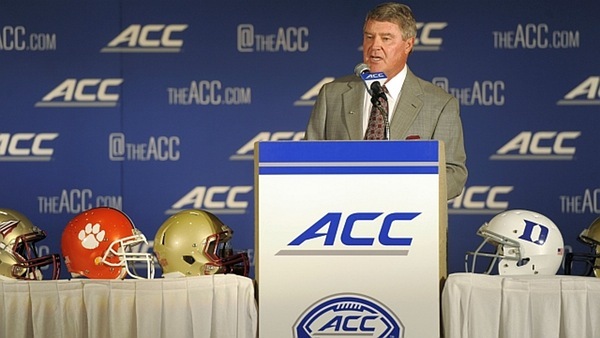 John Swofford, President of the ACC. Lastly, there is still one state in the union who still can not host pre-determined NCAA Championships, and that state is Mississippi. Baseball teams never use brand new baseballs in a game because they’re too shiny to play with. Umpires use New Jersey mud to prep and dull the shine of the balls. 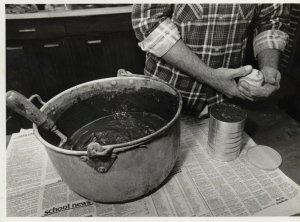 Lena Blackburne Baseball Rubbing Mud has been used by every Major League and Minor League Baseball Organization for nearly 75 years. 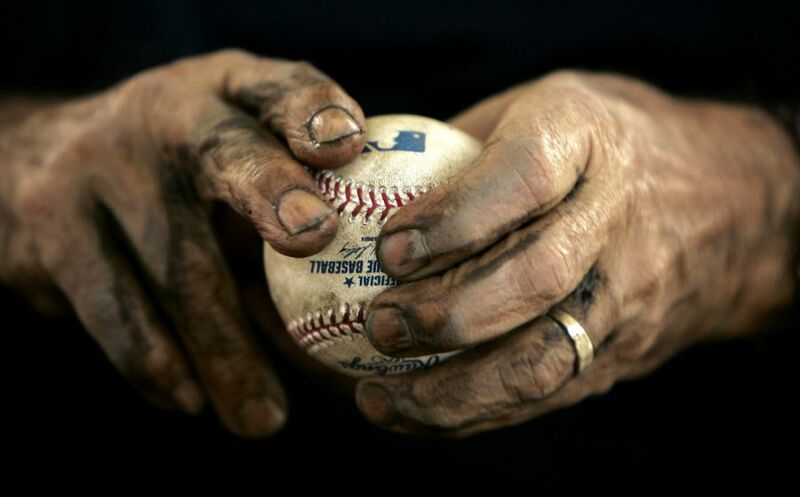 It began in 1938 when an umpire complained to Lena Blackburne, a third base coach for the old Philadelphia Athletics, about the condition of the baseballs used by the American League. Back in those days, a ball was prepped with mud made of water and dirt from the playing field. But the ball’s cover was too soft, leaving it open for tampering. Something was needed to remove the shine, but not soften the ball’s cover. The next time Blackburne returned to his home in Burlington County, he took on the challenge. He checked out the mud along the Delaware River until he found some muck with a texture he felt would fix the problem. He took a batch to the Athletics’ field house and rubbed some of the balls with it. It worked, had no odor, and didn’t turn the balls black. The umpires were very happy and Lena Blackburne was in the mud supply business. The entire American League began using the gunk and later, the National League. Before Blackburne’s death in the late 50’s, his baseball rubbing mud was being used by every major and most minor leagues in the United States. Blackburne’s mud business and the mud’s source was left with a close friend, John Haas, who had helped Blackburne on his mud-finding adventure. Haas eventually turned over the enterprise to his son-in-law, Burns Bintliff. Then Burns passed it on to his son Jim’s family. Each July, Jim and his family head out on a boat and scoop up hundreds of pounds of the mud, enough for the season. Then the mud rests in barrels until the next spring when it’s packed and shipped to each of the major league teams, minor league teams, most independent leagues, and many colleges in time for opening day. So next time you’re watching a game and you hear the umpire yell “Play ball!” remember New Jersey mud is a part of it. I did not hear about this story until I was asked to write about it and I was completely blown away. 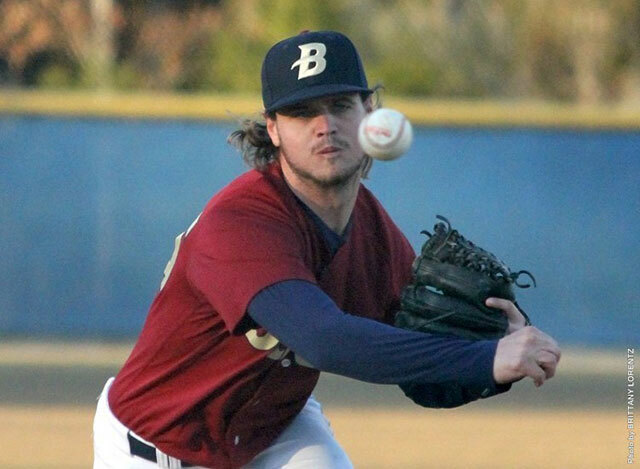 University of South Carolina Beaufort pitcher Jason Boulais provided a cheek swab to the “Be The Match” registry on his college campus last October for potential bone marrow donors. He was told in March that he was a preliminary match for a boy in France and the blood tests confirmed it. Boulais had surgery in May to have bone marrow removed for his back and pelvis, even knowing it would end his senior season after 10 games. According to the MLB, Jason has completed a two-week recovery from the procedure and is now 100 percent healthy. Boulais was intrigued when he was asked if he wanted to save a life before he signed up for the “Be The Match” program. “They came up to me,” Boulais recalled, “and they said, `Hey, you want to save a life? '” “I said, `Yeah, why not? Let’s see what this is all about,'” he said. “Who wouldn’t want to do that?” He had the inside of his cheeks swabbed a few times and was told that they may never talk to him again or they might call him in 10, 20, or 30 years, but they just didn’t know what would happen. He went on his way. He received a call a few months later to find out he was match. With the ninth selection in the MLB draft, the Chicago Cubs select outfielder Ian Happ, OF, from Cincinnati. At 6 feet, 205 pounds, Happ is “one of the top, if not the best, college hitters in this year’s draft.” says Jason McLeod, senior vice president of scouting and player development for the Cubs. He also said that Happ will fit in along the lines of Kris Bryant and Kyle Schwarber. Ian Happ is 20 years of age and is quickly becoming a star. In his junior season with the Bearcats, Happ batted .369 with 18 doubles, 14 home runs, and 44 RBIs. 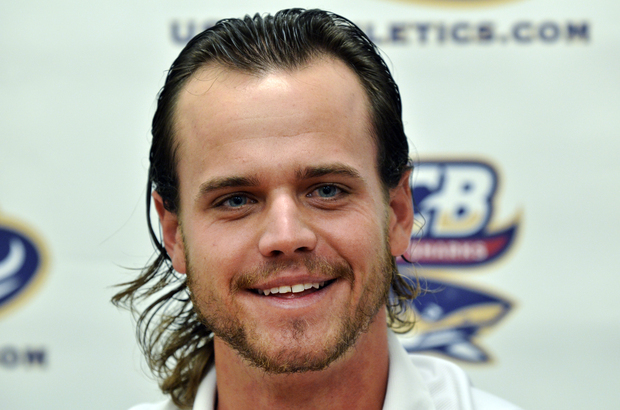 His .492 on-base percentage propelled him to earning Player of the Year for the American Athletic Conference. Ian was also an All-American First Team. Ian Happ also becomes the first player from Cincinnati to go in the first round of the MLB draft. “I’m very excited to add to the college bats that are coming through and hopefully be the next one to move through the system,” Happ said. Ian Happ primarily plays the outfield but will be moved around the infield. Happ has a great swing that adds to his phenomenal plate presence and is known to really drive balls deep into the gaps. Happ is also a switch hitter but is said to have more power on the left side. He also has no problem hitting the ball to the opposite field. Having not played infield since his freshman year of college, Happ will need to work on it but should not be a problem for this young and very talented kid. Along with getting drafted at number nine, Happ’s assigned value is $3.351 million. Happ is sure to earn his paycheck for he is patience at the plate hence only 49 strikeouts in 198 AB. Happ also was an avid leader in many statistical areas during his junior season and will for sure be a definite impact in the Cubs minor league system. A wrist injury kept Donnie Dewees out for much of the 2014 season but rebounded quickly. Dewee was the Atlantic Sun Conference Player of the Year ranking among the top sophomores across the country in just about every offensive stat category. Dewees also became the schools highest player picked in the MLB draft since transitioning to Divison I back in 2005. Donnie Dewees hit .422 with a slugging percentage at .749. He finished the year with 18 HRs and led his team to a 45-16 record, the programs best. Another great stat of Dewees is he only stuck out 16 times in 60 games. His great patience at the plate led to 30 walks for the young slugger. Dewees can play all over the outfield but center field may be a problem due to his lack or arm strength. Dewees looks to be a great fit for the Cubs and may even play alongside Ian Happ down in Single A where I suspect they will start. Just finishing his senior year of high school, Bryan Hudson was ranked as the 71st prospect by MLB.com. Hudson is 6` 7“ with a big athletic frame. 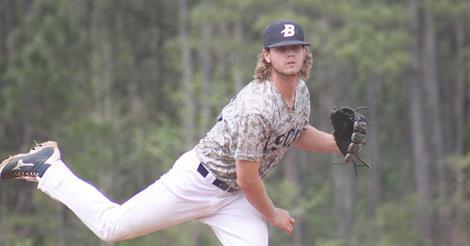 Hudson had a fantastic high school career and looks to take his phenomenal pitching to the next level. Hudson is said to be the best prospect out of Illinois since Mike Foltynewicz. Hudson’s main go to pitches are his curve and fastball. His curve-ball is steep and gets a lot of batters out in front. His fastball tops out around 90 MPH and hopefully he will be able to replace the zero with a three or a four in the near future. His 6` 7“ height is a huge boost to the velocity on his pitches. Hudson will look to improve his location and improve on other pitches when he reports to the Cubs. Hey Guys! I’m the newest addition to Cleat Geeks! I’ll give you a little information about myself and what to expect going forward. My name is James Knox, and I am 34 years old. I grew up in the Gateway City (St. Louis), after moving there when I was 11. I graduated from Southern Illinois University-Carbondale with a degree in Communications (focus on radio and television, I work in radio), and also pitched all four years as a Saluki. I am now working on my Masters degree at Western Kentucky University. I am a testicular cancer survivor of ten years and now live in Western Kentucky. I am a baseball/softball umpire, and have called some major Little League, Babe Ruth, NSA, ASA, and USFA softball tournaments. This is my 20th year of calling games. I am a HUGE St. Louis sports fan. 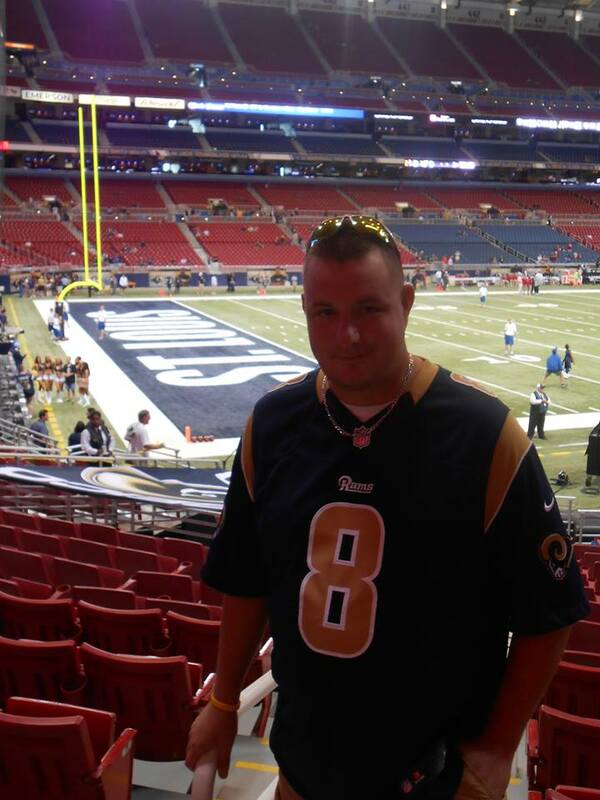 The Cardinals, Rams, and Blues are my teams, and in college; it’s Illinois basketball and Alabama football. So what to expect from me? Everything! Obviously, the title will give you the idea that a lot of my stories will come from my baseball experiences on the diamond; as a player and umpire, and while that’s true, I am opinionated about everything. I had a podcast for about two years, “The Hard Knox Podcast,” which was successful, but I wasn’t reaching nearly enough people. Thankfully the fine people here at Cleat Geeks have given me that platform. So that’s a little bit about me going forward…Hope you enjoy! On a beautiful Sunday afternoon at Surprise recreational Campus I waited by the home team on deck circle to hopefully speak to the most talked about talent on the field that weekend. 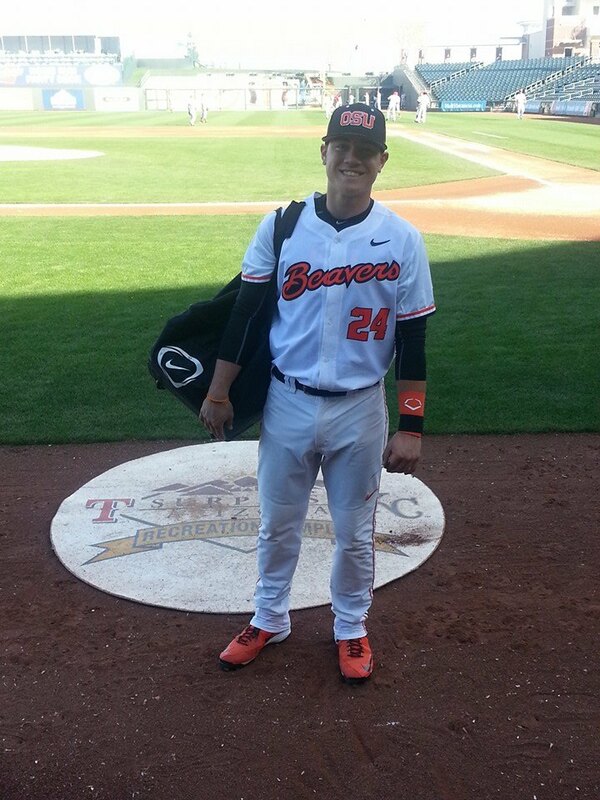 Oregon State University catcher/1st baseman K.J. Harrison. Why was he the most talked about? 1st, he was drafted in the 25th round by the Cleveland Indians in this years draft, yet he decided to enroll and play for OSU. Second, he passes “the eye test.” During OSU’s game on Saturday against Michigan State I was sitting in the press box behind home plate soaking up the action. K.J. hit a ball so high into the air that it was out of my line of site in the booth. I was forced to follow the left fielder as he was tracking the ball and when it came down it cleared the 379 marker in left field as I picked my jaw back up off the floor. K.J. did not hesitate to talk to me. In fact he was very gracious with his time. But what struck me the most was the huge smile he had on his face. A smile that not even pine tar could wipe away. 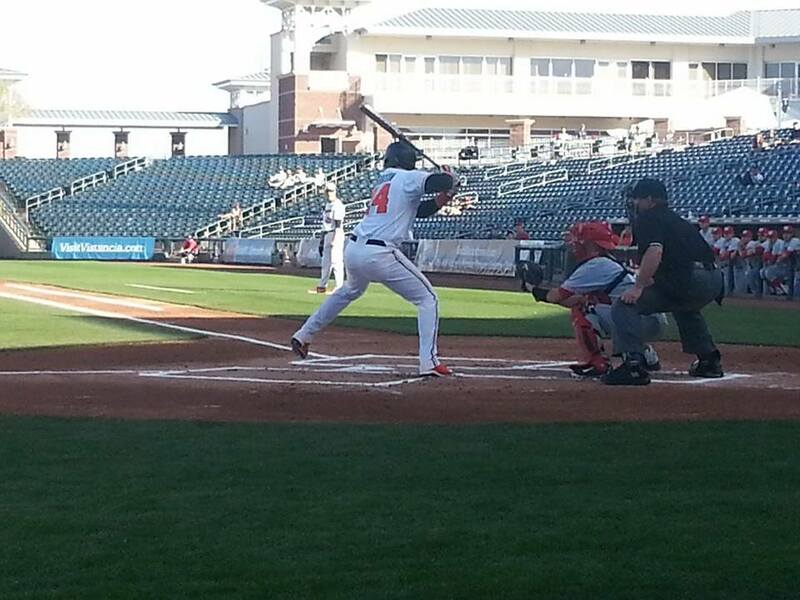 Michael Ballentine- You were drafted by a major league team in the Cleveland Indians in the 25th round. Then you come here to Surprise Stadium and absolutely crush your first home run of your college career on a major league field. How did that make you feel? K.J. Harrison- It was awesome it was just one of those surreal moments being a freshman on this beautiful. I was just getting ready for a fastball to come, I got geared up for it and I got the barrel on it. It was awesome! Me- I love the smile on your face, and the fact that you are so approachable for someone who has had so much success so early in their career. I have met some real jerks covering sports, and you are definitely not one. What do you attribute that to? K.J.- I like being around people, I am just a free and easy guy. And when it is on a big stage like this I still look at it as another day at the park and I make sure I enjoy every moment of it with a smile on my face. Me- How are your teammates taking to you? You are a freshman, you have scouts here today watching you. Are they jealous, did you get welcomed in with open arms? K.J.- They are not only fine with me but they are proud, and I of them. We play as a team we play for each other. On this field we battle for each other so everyone is fine, we are truly a team. Me- So what made you decide to commit to Oregon State instead of the Cleveland Indians? K.J.- I felt like right now this was the place for me to go Coach Casey, Coach Bailey and the rest of their staff they have an amazing program that I fell in love with from the first time I arrived here. I wanted to come and play at a great baseball school, and I came to the right place. Me- I know that you are part of OSU, part of that team. But, what are you trying to do individually this year? K.J.- I am just trying to play my best, get better as a baseball player. I am not a selfish guy, I am not an individual guy, I want to do everything for my team. We are trying to get to that College World Series and play in Omaha. Remembering that this is his freshman year at OSU he is 18 and does not turn 19 until August of this year, he was very poised both during the interview and especially on the field. His father was an All-American in Hawaii, where K.J. is also from and actually spent some time in the minor leagues. In talking with a few of the scouts who were in attendance they were impressed with his receiving as a catcher and with his power and bat speed through the zone at 5 foot 11 and 190 pounds. Last year as a senior in high school Baseball America had him ranked as the 138th best prospect in his draft class. There is no doubt that K.J. will be drafted again, every major league could use a person with his skill set who can play multiple positions. We wish K.J. all the best and hope to follow him for years to come. After picking off a base runner in the 9th inning and preserving their victory over Northwestern on Sunday afternoon at Surprise Recreational Campus in surprise Arizona, I was surprised. College baseball teams tailgate. Yes, I am serious they tailgate, and they invite the team over for food and soft drinks and sometimes they even invite members of the press too. 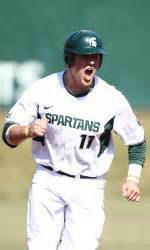 Michigan State 1st baseman/catcher Blaise Salter. While I was there I took the time to interview the player who hit the biggest fly ball of the tournament, even if it was foul, Michigan State Catcher and 1st baseman Blaise Salter. He has absolute power as confirmed by the monster shot he hit off a change up that on a line sailed clear out of the ball park and into the parking lot to the left of the left field foul pole. Last year Blaise Led the team and ranked third in the Big Ten with 50 RBIs. He ranked second on the team in batting average (.317) and his 22 doubles were the most in the Big Ten all while recording a hit in 44 of 57 games. Michael Ballentine- This is the start of your senior season, so tell me the best thing to happen to you in your first 3 seasons at Michigan State? Blaise Salter- Probably during my freshman year when we were selected to go to X Game Regionals, I hope we get selected to back there again this year. Me- You are on some of the different top 100 prospects lists for college players being considered for this years MLB draft, how does that make you feel? Blaise- All of that is good, but I would rather have team success. I want to be able to win the Big Ten Championship this year. We have not had a chance to win that since I have been here. And I would like to be part of the team that changes that in my senior season. Me- So then your more about the team as a whole than you as an individual? Blaise- Of course you win and loose as a team and this year I think we have a chance to win much more often than we loose. Me- So currently you play 1st base and catcher, which one of those positions do you prefer? Blaise Salter celebrates with teammates after another home run . Blaise- It does not matter to me. I like catching because you control everything, and I like playing 1st base as well. Basically, whatever the team needs me to play on a given day I am happy to do. Me- I was directly behind home plate yesterday watching you catch. You are listed at 6 foot 5 inches tall and 245 pounds. Do you think you are to big to catch long term? Blaise- I know it is not the norm now a days but I embrace it and I enjoy doing it. 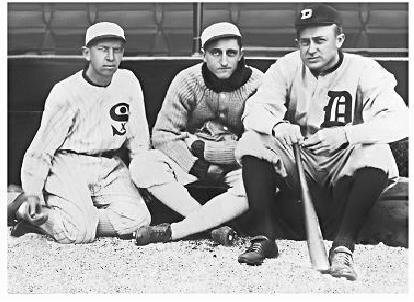 Plus, there are and have been some catchers my size in the past in the majors who have done it, so it is not unheard of. Me- As far as hitting goes, would you rather hit one down the left field line and drive in 2, or take that slow walk around the pillows after crushing one over the fence? Blaise- I would rather hit the double and drive in the extra RBI to give my team the chance to win. Me- Again since this is your senior season, what are you looking forward to when you get out of college? Blaise- I want to make sure that I get my degree, which I will finish up in December. And hopefully I will get the chance to play at the next level. And looking further down the road I think I would like to be a baseball coach somewhere. Me- So what is your degree in? Me- Last question as we wrap things up and I thank you for your time. Today you get a win on a big play in the 9th inning against Northwestern. Yesterday you guys tie the game in the ninth yet you lose to Oregon State in extra innings. Besides the fact that one was a win and one was a loss, what did these games here in Arizona mean to you and this program? Blaise- Yesterday was a tough game and OSU is one of the better teams in the country. I think it was really good for us as a team to come out here play some really good teams on the west coast. We won today but as you said we hung tough and played hard yesterday and took OSU to extra innings so I am proud of our team for that. Last year in his junior season with the Spartans, Blaise was the winner of the John Kobs Most Valuable Player and Kirk Gibson Offensive Player of the Year awards. He was a great to talk to and was very generous with his time. I predict that he will get a chance to play at the next level, but that he will eventually move out from behind the dish and become an everyday 1st base/ DH as he advances. We here at cleatgeeks.com wish him all the luck in the world and we hope to be covering him in the big leagues in the not to distant future.